Vintage Clothing Blog | Vintage Wedding Dresses | Salvage Life: Don't get this Rose Petal Necklace Wet! Don't get this Rose Petal Necklace Wet! A friend recently showed me a necklace that she inherited from her Great Grandmother from the 1920's. 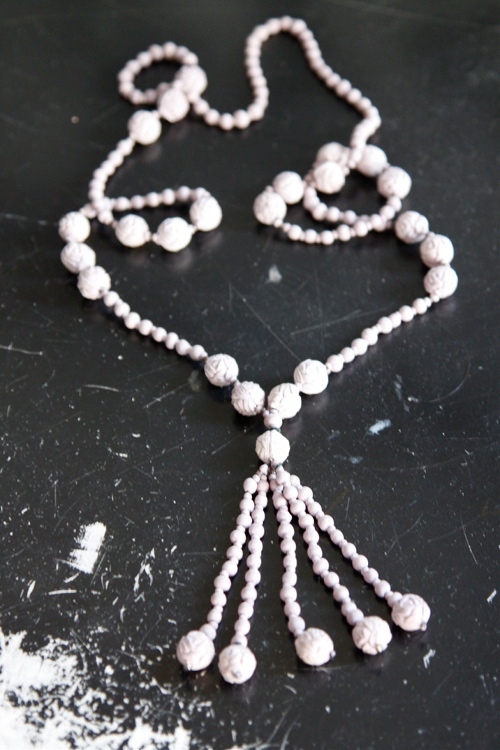 It was a pretty faint pink color and the beads were made from actual rose petals! She later emailed me a link to one she saw on Ruby Lane and I was so excited, I bought it. When it came in the mail the other day, I put it on right away. The necklace is a light lavender and came with instructions to not get it wet or it would dissolve. Such an interesting piece, I love that it is made of such delicate material and has survived so long. Wow, that's amazing! I've never heard of beads made from rose petals! What a find :) !